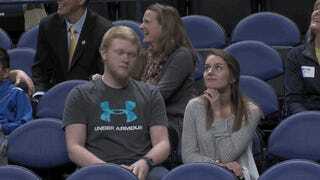 A fan at a UNC Greensboro men’s basketball game used his time on the Hug Cam to pull off a wonderful trick. He started to embrace the woman sitting next to him, and at the last second, dabbed on her. Keep your head on a swivel. A face has never more accurately projected, Goddammit, Derek. According to the school’s athletic department, the clip was from a Jan. 21 game against Chattanooga, on National Hug Day. It wasn’t used until Valentine’s Day, when the UNCG promotions department tweeted it.